A backpacking stove must be the first stuff in your camping backpack. So today I am going to talk about how to choose a stove in your backpack. When you and your family or your friends are planning to go camping, you must want to know how to make a campfire when you are in outdoor camping. However, making a campfire by yourselves is a hard work for a group of family camping team. So now you must want to have a handy and convenient backpacking stove to take place of thecamping stove when you are preparing the stuffs before going camping. 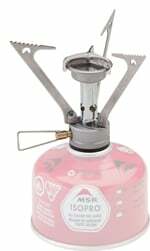 But there are too many kinds of stoves, and how to choose the best backpacking stove is the first question. So in today’s essay I am going to talk something about the backpacking stove. They are easy to use and low-maintenance which can screw onto the threaded tops of closed fuel canisters that contain two pre-pressurized gases: isobutane and propane. Some of these stoves are incredibly small even only a few ounces, they can also be fold up compactly. They’re quick to light, so the priming is not necessary before lighting a canister stove. Turning the valve and lighting with a match, lighter or piezo-igniter is all you need to do. You can adjust the flame easily and simmer it well. When you unscrew the stove, in order to avoid spills and leaks, the canister self-seals. To provide consistent heat output throughout the life of the canister, it will have a built-in pressure regulator. Cold weather and high-elevation performance. Large pots can not be held by the stove. You can not tell clearly how much gas is left inside the closed canister, so bringing an extra is better. Canisters will depressurize and produce a weak flame when you are in cold weather. The cost of fuel is greater. I’m a content writer, specializing in articles around road trips, Camping, and other traveling topics. I can write fashion guides and also informational posts on the latest places updates and trends. Please let me know if you accept guest contributors and what sort of topics you would like to explore, also if there is any fee to publish each post.